Ethical marketing practice is important for business organizations for many reasons. Obviously good ethics enhances corporate image, brand image and creates a favourable reputation. Defined simply, ethics is self governing behaviour or principles. 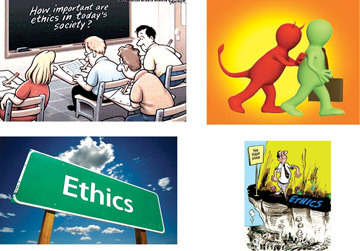 What is ethical is not always legal, hence ethics are practiced to demonstrate good governance. Marketing is a discipline that always has to deal with external public, namely competitors, customers, intermediaries and suppliers. Hence, there are several occasions where ethical behaviour is required. Let us examine these instances. Marketing communication is an area where ethical behaviour is called for. There are regulations governing the industry but good ethics can be practiced beyond the legal requirements. For example, the careful use of women and children in advertising, wherever appropriate. Not abusing children in advertising by getting them to endorse brands, instead of products. Not using women as pin-ups for brands that have no relevance to women at all. Another area where ethics in Marketing Communications is violated is making false claims or hidden promises. For example get discounts up to 50% but the highest discount is only 20%!!. Product X eliminates something but it only controls. Marketers must not hoodwink customers as the negative word-of-mouth can be really damaging. Be honest and promise only what your product or brand can deliver and you will get long term results. Packaging is another area, where ethics can be practiced. False claims on packaging should not be made, such as made out of recycled material etc., if it is not the case. Packaging regulations is one thing, ethics are altogether something else. If packaging regulations are flouted, legal repercussions will arise. When conducting intermediary promotions be ethical. Don’t request a retailer to stop selling competitor products, since it goes against the principles of retailing. Whilst this is not illegal, it is not ethical. Asking a retailer to give preference for your brand is ethical, given the special benefits offered. Most marketers are now investing in sophisticated CRM software, to track customer purchasing and shopping behaviour. However, the confidentiality of this information must be ensured and no third party should have access to it. This would violate the privacy of the customer and constitute to unethical behaviour. Permission should be obtained from customers in advance to use their purchase data, for promotional purposes and relationship building. (Permission Marketing). Exploitative pricing is not at all ethical. Consumers should not be abused utilizing a special market opportunity. Legally there may not be a problem, but making super profits at the expense of customers is not ethical. Even differential pricing is being questioned on ethical grounds. When it comes to products, certain raw materials are legal but not ethical. Marketers are called upon to take a decision in such situations. Using raw materials which are both legal and ethical are ideal. A commitment to good social and community practices can also be classified as good marketing ethics. After all, the community comprises your customers and you need to deal with them ethically. 1. The image of the organization is enhanced, together with the image of the brands marketed. 3. Better social and community relationships can be built. 4. Less external pressures on the organization by regulators. 5. Customers may give preference to the organizations products and services.